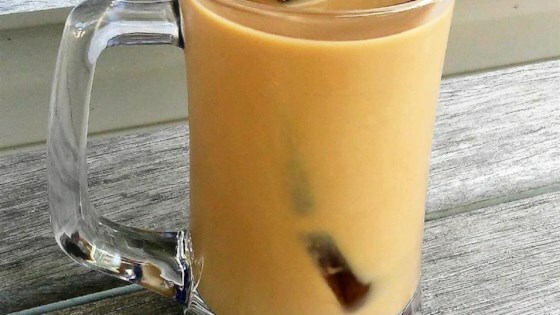 "Cold-brewed coffee poured over coffee ice cubes makes the best iced coffee. It takes a bit of planning, but its full, rich flavor makes the wait worthwhile. The ideal coffee for this cold drink is a blend of mid-roasted beans with moderate acid. Using a dark roast and beans high in acid produces a sharper, more bitter result." Fill a tall glass with coffee ice cubes. Pour in the cold brewed coffee. Sweeten to taste with Sweet'N Low. Add milk as desired. See how to make coffee concentrate for a hot or cold beverage. Cold brewing makes coffee with more aromatic, complex flavor and less bitterness or acidity than hot brewed coffee. Good recipe, tastes much better with sugar. Also, 'Sweet and Low' is extremely dangerous.